Recently, we had a few unusually cold evenings and I began craving comfort food like I do at the end of every warm season. Call it what you will, but I’d like to think that this is more of a cultural thing. I come from a cold country where you have to stock up on fat for the winter or you’ll freeze. Well, not really anymore, but you get the point. So, every year around the end of summer I struggle with my nutritional compliance because the only thing that I want to do is eat pork roast, mac and cheese, meatballs, and bread. Yes, my inner Russian is screaming for potatoes and other carb and fat heavy foods. Do I give in? No! Why? Because a bowl of mac and cheese is not worse throwing out a day at the gym. Not to mention after eating clean for a while, my system goes into shock and has no idea what to do with all the delicious, heavy, goodness I just gave it. So, naturally I stop feeling well and start feeling just slightly heavy, wobbly, and blah. Honestly, it is not a comfortable feeling and I’d rather stick to clean and amazingly delicious food. One of my favorite winter comfort foods are meatballs. I love a good meatball and I love the versatility of it. You can putt a meatball over almost anything and make it taste amazing! Which is why I developed this wonderful green meatball recipe. It goes well on salads, in wraps, on sandwiches, as a soup garnish, and in the morning eggs… Short of dessert, I put these meatballs in almost every meal in my day and it works well! Well, I am not going to continue telling you how incredible they are and just let you make them for yourself. Here’s the recipe. 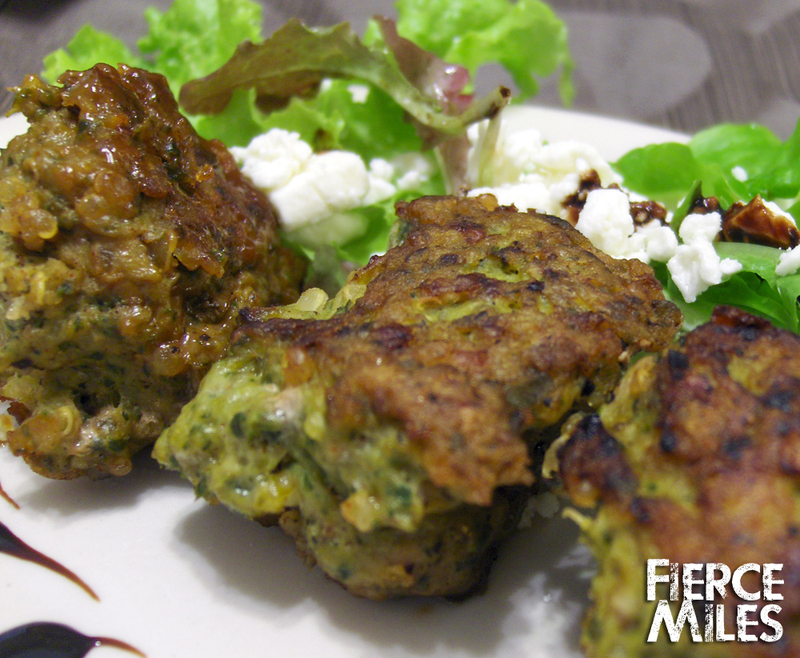 Combine spinach, feta cheese, paprika, curry, garlic, and black pepper in a kitchen processor. Pulse until the mixture is incorporated but not liquid. In a large bowl combine the spinach mixture with the ground chicken and mix until well incorporated. Preheat a non stick pan, add olive oil. Using a tea spoon, scoop the meatball mix into the pan and brown on a couple of sides to lock in the moisture. This is a quick process and shouldn’t take more than a 1/2 a minutes on either side depending on the temperature of your pan and the size of your meatball. Once the meatballs are browned, add the chicken broth, lower the heat, and cover with a lid. Allow to steam for 7-10 minutes depending on the size of your meatball. Remember, larger meatballs will cook slower. If you are not sure if your meatballs are done, pick the largest one and cut into it. If the center looks wet, you probably have a few more minutes to go. After your meatballs are done, serve them with quinoa, veggies, beans, or atop of a refreshing Spring and Feta Salad (pictured). It is no secret that the key to a successful, injury free running season starts with training all those areas that generally go neglected during the run because our body prefers to rely on larger muscle groups to do most of the work. 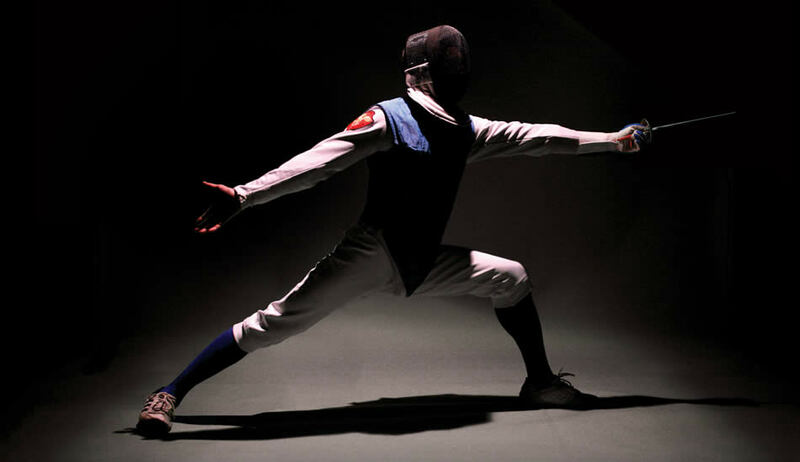 This imbalance could lead to improper biomechanics and subsequently annoying injuries that derail our progress and potentially take a mental toll. Below is a workout that is designed to target muscle groups in both upper and lower body for proper balance. Depending on your ability, I would recommend doing this workout AMRAP (As Many Rounds As Possible) for 35-40 with a proper warmup and cool down periods. If you are feeling especially great, workout on the track and add a sprint at the end of each round. Alternatively, you could also add weight to the lunges, squats, and step-ups. Be sure that you are ready before you modify your workout. After all, you are training to prevent running injury not to get hurt during your workout and end up missing all the running fun. Have fun, be safe, and let me know what you think! 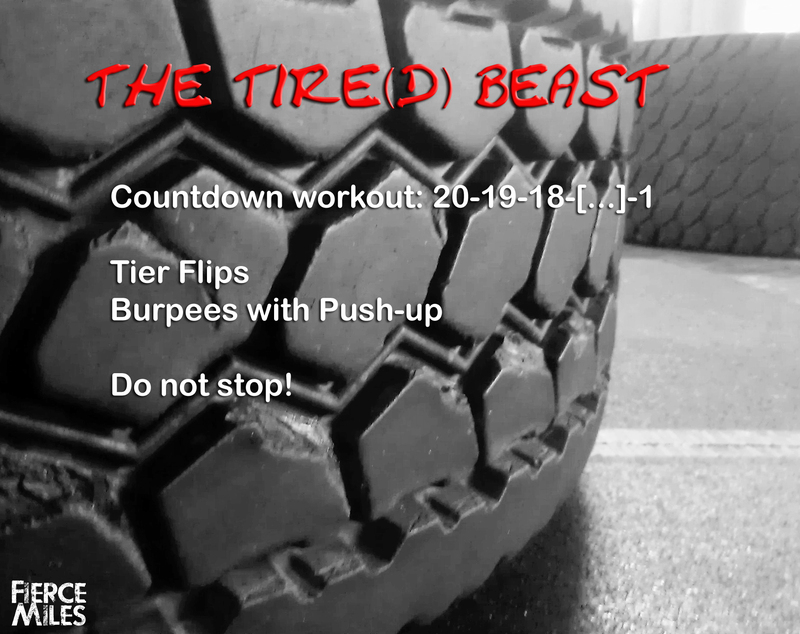 Fierce Workout: The Tire(d) Beast. Happy Wednesday, everyone! 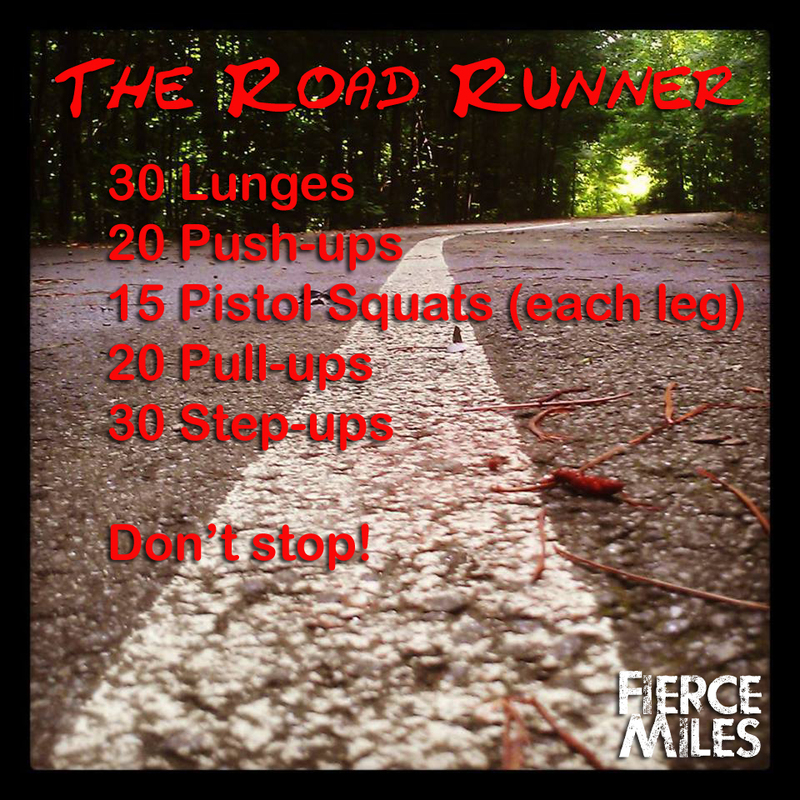 It is time for another Fierce Workout! I was going to hold of to share this workout until later in the month, but I just couldn’t help myself. I designed this workout with the idea of cardio hell in mind and, oh boy, did it deliver! This is an effective, whole body circuit that targets everything from your lats to your calves. For a more challenging workout add a tire jump or substitute a frog burpee instead of the regular burpee with a pushup. 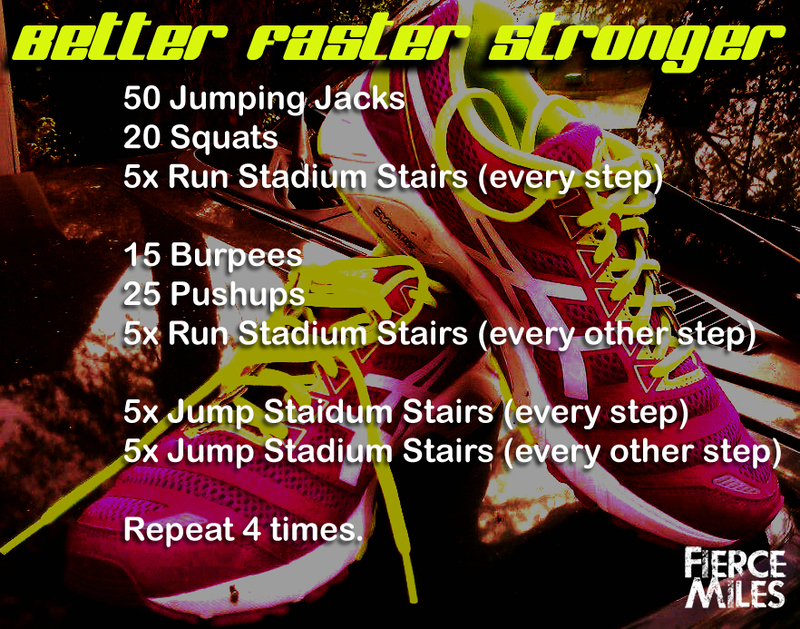 If you are looking for something that will be short, sweet, and effective, this is just the workout for you! Let me know what you think about this workout in the comments below or on our Facebook page! 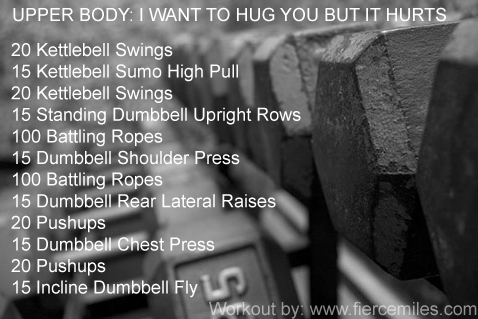 Upper Body Workout: I want to hug you but it hurts. Recently I found out that I really love kettlebells and ropes. I did this workout a few days ago and I have to tell you, I had a hard time giving hugs to my friends afterwards. 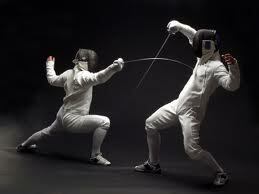 It was a lot of fun, it kept my heart rate up, and I felt incredibly satisfied afterwards. Of course, since I found this to be incredibly fun, I decided to share it with you. Let me know what you think about it! This past weekend I was attending Atlanta Finest 5K race which benefited Crime Stoppers Atlanta, a program of the Atlanta Police Foundation that empowers Atlanta residents to take a stand against crime in their communities. Not only was it a race for a good cause but it also allowed the participants and their families to get acquainted with different divisions of Atlanta Police Department (APD) and talk to the officers. I had the opportunity to talk to an officer of the Mounted Patrol and pet his wonderful horse who attempted to lick sweat of off my arms through the duration of our conversation. 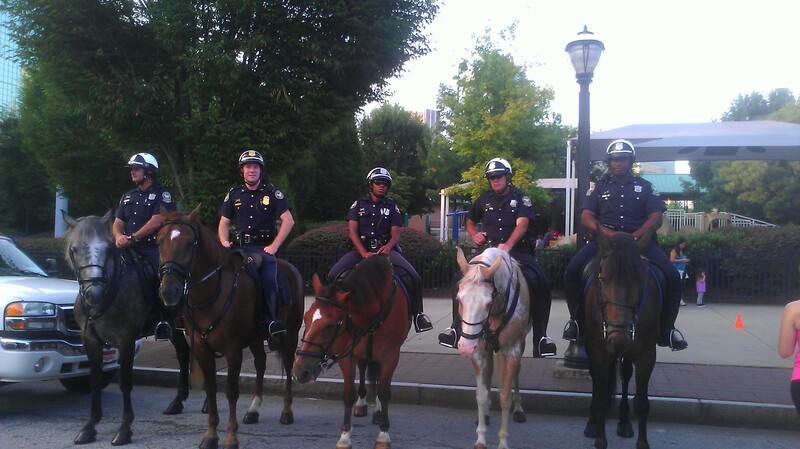 The Mounted Patrol was recently brought back to APD and currently has 12 officers who are usually assigned to patrol parks, sporting events, and festivals. Patrolling from horseback has been found to be the most effective way of crowd control and allows for better visibility of the officers. After I was done talking to the Mounted Patrol unit, I had a rare opportunity to sit in a SWAT vehicle. 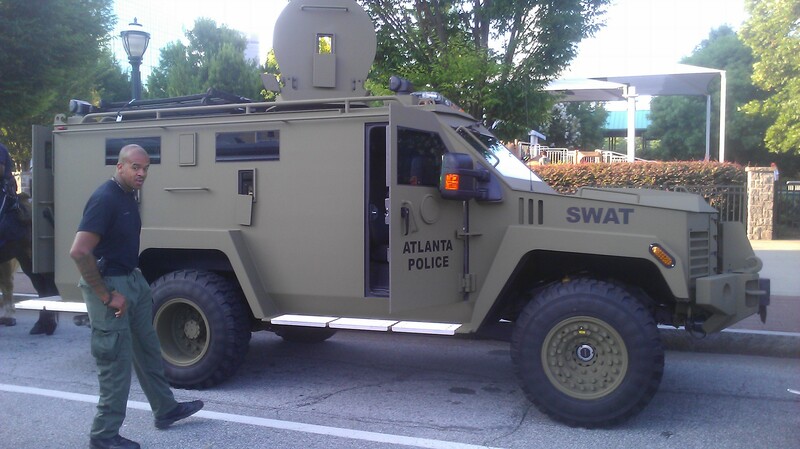 The officer that I was talking to told me that the 550HP, turbo diesel, armor plated assault vehicle will seat 8 210lb men in their assault gear relatively comfortably. We talked a little about their training and day -to-day activity, discussed the vehicle a little more and I was on my way to find a comfortable place to sit and eat my post race bagel. We were greeted by this on our way to the Start. 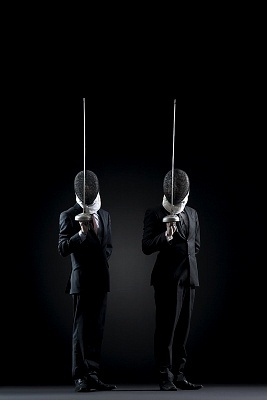 Of course, you are wondering about the race…. 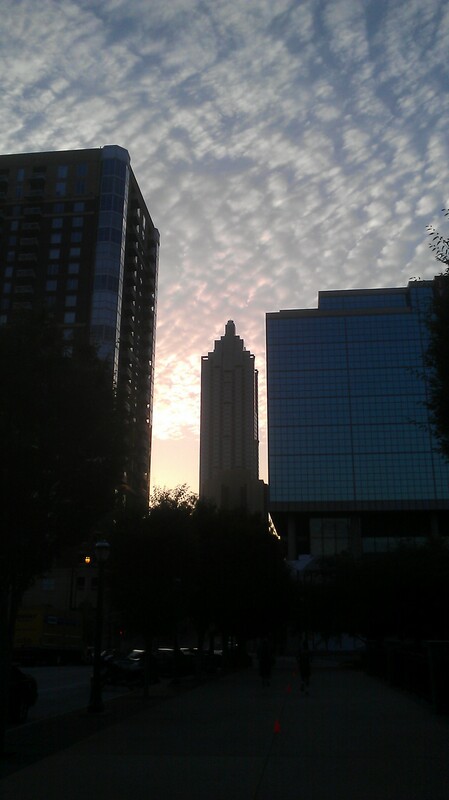 I love running in ATL in the early morning! When I arrived, I had no problem finding a parking spot just a short walk away from the event. I went to the number pick-up and didn’t have to stand in line. ( I know, right, this is sounding like crazy talk!) The music was playing, the sun was coming up, the crowd was buzzing, and the lines to the only bathroom wrapped around the building. The ease of access and parking was completely overshadowed by the fact that one had to stand in line for 20 minutes to get to the lavatories (we all know how important those are pre race!). 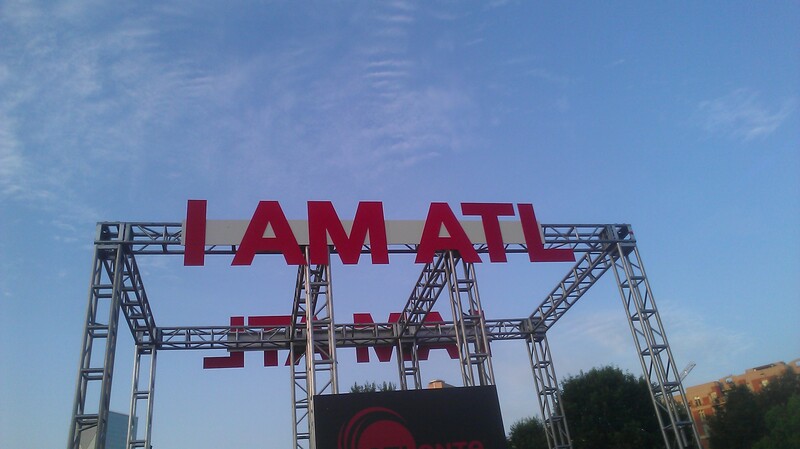 The race started firmly at 7:30 am after a few short speeches by Atlanta officials and the Chief of Police. The race was hilly, hard, but laid out well. The encouragement and cheering from the officers that were stationed throughout the route to monitor traffic was much needed and well received by all. Love this shirt! Ain’t that the truth! I honestly can’t recall of what happened during the last .10 of a mile as I was very tired and incredibly hot. 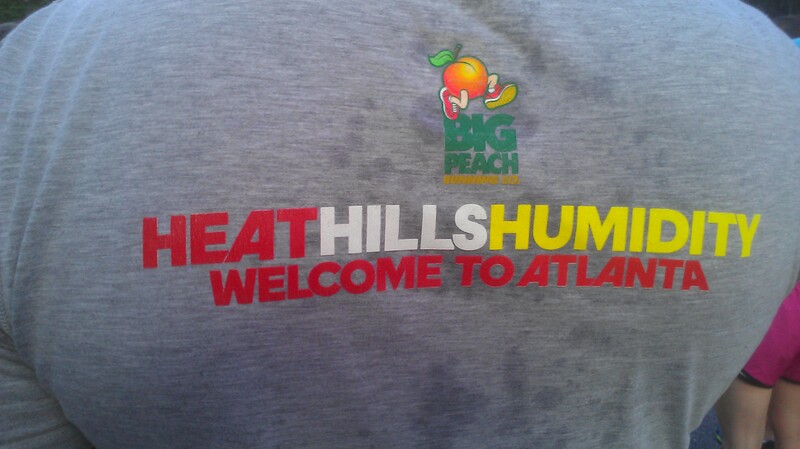 I know that I crossed the finish line on tiered, heavy legs, and couldn’t wait to eat my bagel and drink my water. That being said, I PRed the race 2:00 minutes faster than my previous fastest 5K time. Can I beat that time this weekend? I am pretty sure that I can! 🙂 Here’s to setting a new PR this Saturday at the Jog Days of Summer 5K. I grew up in a culture where soup is the ultimate lunch food. I remember sitting in my grandmother’s kitchen, watching her make large pots of fatty broth (the correct reference would be “stock”, but you couldn’t tell that to my grandmother! ), load it full of new potatoes, carrots, peas, mushrooms, and anything else that would keep its texture in the pot and let it go for an hour or two. Although I loved my grandmother’s cooking, I am a firm believer that unless you live in the tundra, a 1000 calorie bowl of soup is not what you need. Recently, I set out to “modernize” and “lighten” some of the old-school Russian recipes that were passed down to me from my elders. Here is a new, light, and delicious take on the Chicken Mushroom Soup. This dish makes a great post workout meal as well as a great any time food. I deliberately avoided adding potatoes because of the high carbs, but if you are a runner or just simply need a higher carb count in your meal, throw in two or three diced russet potatoes at the end. When the potatoes are nice and soft, your soup is done. Enjoy and let me know what you think! Clean and chop the mushrooms into bite sized pieces. Clean and chop the parsnip and celery into bit sized pieces. Heat up a large, none stick pan with olive oil. Combine celery, parsnip, mushrooms, and spices. Sautee until the mixture reduces in size. Take the chicken you reserved from making the broth and pull it apart. In a large broth pot, combine the veggies, the chicken, and the broth. Bring to a boil. Reduce the heat and allow to simmer for 5 minutes, turn off the heat. Add chopped cilantro and chopped green onion, stir and allow to sit for 2 minutes before serving.